We had an awesome Bibliobop Dance Party today. We had almost 60 biblioboppers (yay Summer!). This program is one of my favorite projects (to read more about it check out this post from a while back: Bibliobop), and it’s been very successful at our library. Originally we planned it to run as alternative to storytimes during the summer, but our turnout was so good we do them all year round. Plus, I’ve been invited do a Bibliobop at a local shopping mall. My dance card was so full, in fact, that I had no time to take pictures. Maybe next time. 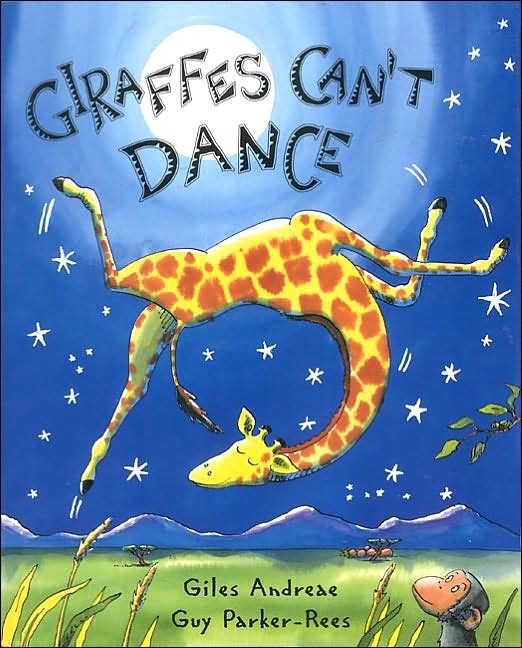 Giraffe’s Can’t Dance. In general, I find rigid rhyme structures clunky and difficult to read in a storytime. With a few exceptions, I often either get lost in the rhythm of the language and wind up sounding robotic to the point that I lose the expression in my voice; or I lose the rhythm when I start using expression in my voice. Kind of a lose-lose. However, Shelley realized that this picture book is written in the exact meter as Miss Suzy Had a Steamboat. whose neck was long and slim. and his legs were rather thin. and munching shoots off trees. he buckled at the knees. It was a huge hit! Everyone was clapping along, tapping their toes, and (most importantly) on the edge of their seats. Now I can’t wait to read this story at storytime. Not only did the singing lighten the load of the rhyme structure, but my familiarity of this particular tune (I’ve known Miss Suzy since I was knee-high to a bee) makes it easy to express the drama of the story. The moral of this story is a 3-parter: 1) Talking about picture books and storytimes with great co-workers and colleagues is so important. A fresh pair of eyes can discover wonderful things about a story that you might never see yourself. 2) You haven’t read a picture book until you’ve read it aloud. 3) If at first your read aloud doesn’t succeed, you can always try it again.